The City Council unanimously voted to withdraw a planned growth ask from Metro. The Sherwood City Council voted 7-0 on Tuesday to halt a proposal to grow by by several hundred acres. In doing so, the city will withdraw a letter of interest to the Metro Council — the regional government that oversees land-use issues — asking to expand the region's urban growth boundary by several hundred acres this year. With the vote, the Council brought to an end — or at least pressed "pause" on — a process that has been about two years in the making. The vote took place in a packed room at City Hall, with every seat taken and dozens of folks standing along the walls and in the doorway. At one point, the body heat grew so intense that Police Chief Jeff Groth opened a door leading outside to let in some fresh air. 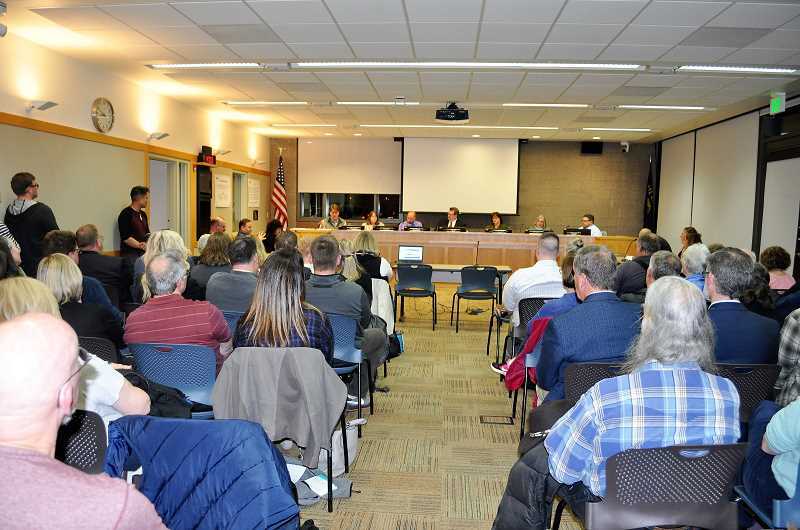 The Tuesday, April 27 meeting included a lengthy public comment period that included strong testimony from those both for and against expanding the regional growth boundary, which would bring in new development in the area west of the planned new Sherwood High School. "My position has been fairly clear," said Mayor Keith Mays, who campaigned against submitting a 2018 growth ask in March's election. "When we look at tremendous growth in Sherwood West or anywhere, we for sure better know what our families, businesses, schools, community partners want, what their concerns are, and respond accordingly together." Every six years, Metro accepts requests from cities wanting to grow the boundary, known as the UGB; it's the imaginary line around Portland and its suburbs beyond which urban development is not permitted. In its initial letter of interest to Metro, Sherwood stated its intention to request a UGB growth of 626 acres west of the city, with the plan to annex that area into Sherwood city limits. That letter of interest was based off work the city's Planning Department had been doing since 2016, and reflected in the city's Comprehensive Growth Plan. In a March meeting, the City Council decided to move forward with a much smaller growth ask of 373 acres, after assessing that there wasn't strong public support for a larger ask. Weeks later, the Sherwood School District Board unanimously passed a resolution urging the City Council to withdraw its 2018 growth ask altogether, citing a lack of accommodations for the thousands of new students an expanded UGB eventually could bring. In the midst of all of this, a dispute between the Sherwood School District and Metropolitan Land Group, a major landowner in the proposed growth area, was coming to a head. Metropolitan owns land that the district plans to use as a site for the new Sherwood High School, and the two parties have been in legal disputes over the price the district will pay the developer for that land. In the April 17 meeting, representatives from both the school district and Metropolitan spoke during the public comment period. John O'Neill, of Metropolitan Land Group, apologized for "any role in fostering miscommunication or mistrust" the developer had played in the process. "I'm here to tell you, we're ready to put the dispute to bed," he said, adding that Metropolitan was willing to come to a compromise with the school district and help pay for costs associated with opening a new school in order to move forward with the urban growth boundary expansion. 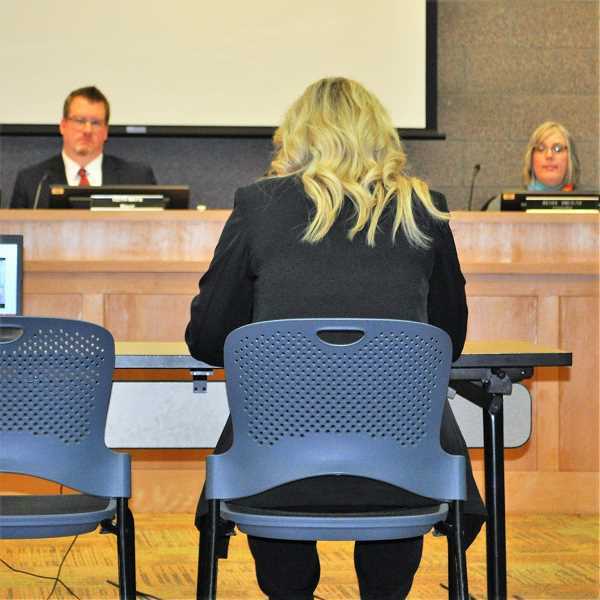 "I ask that you focus beyond the background noise that is being woven into this conversation, and instead think about what 2020 can look like here in Sherwood — the year that that new high school is scheduled to open," said school district Superintendent Heather Cordie during her public comment. "By taking action this evening to withdraw your letter of intent to Metro, you can be an instrumental partner in making that vision for 2020 a reality." The City Council did not take testimony this week from anyone who spoke at the previous meeting. That decision drew complaints from some in the crowd. As councilors discussed the resolution before them, each one made similar arguments in favor of delaying a Metro ask: that the city needed more time to finalize its Comprehensive Growth Plan; that they didn't want to overwhelm the school district or the roads; and that the city will have another chance to submit a growth ask in either three or six years. Councilor Jennifer Kuiper, looking toward those future opportunities, emphasized the need for the city's Planning Department to continue developing the growth plan. "Tonight," she said, "is where the real work begins."